The contest is FREE to enter and is open to people of all ages and talents. You don't have to be a member of the Chapel or FAMILYYA to enter. The contest is open to anyone of any age, race, or gender. Artists who wish to enter can sign-up upon arrival. 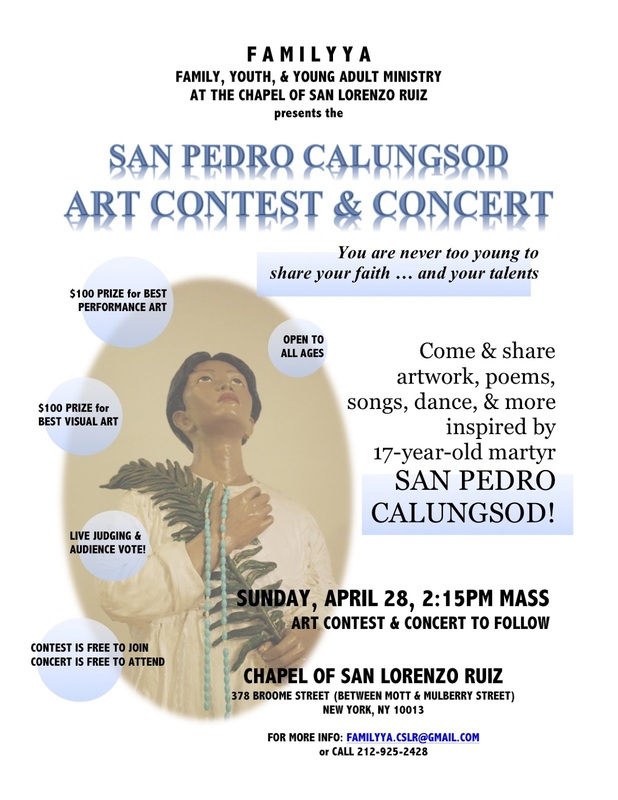 Theme is San Pedro Calungsod and is free to interpretation. So any artwork based on his life or on relevant themes including the Philippines, the Youth, spirituality, courage, etc. is acceptable! Two prizes of $100 each will be awarded to the best visual art and the best performance art, and all participants will receive a prize for entering. There will be live judging and an audience vote, so bring as many family and friends along! The concert and showcase is FREE to attend with snacks and refreshments to be served and raffle prizes! For more information or if you would like to sponsor the Art Contest & Concert, please e-mail familyya.cslr@gmail.com or call 212-925-2428. Donations are also welcomed through the Tree of Miracles, which is on display at the Chapel of San Lorenzo Ruiz!